Boys will be boys, goes the well-known idiom. And boy was I reminded when giving birth to one: about how we’d quickly outgrow our one-bed flat, especially with a wild little boy running around; about how busy we’d be, because boys are a handful; about the need for good-quality, durable clothes, because boys just never seem to sit still; and about how tough these little devils are, at least if you want to believe the prints all over the clothes in the baby boy sections. At Mothercare, they were delighted for us when we said that we knew we were having a boy. That way, we could just buy all blues straight away and wouldn’t have to stock up on yellows. They warned us about the red pram though; with all the blue and white accessories, it could easily get a bit Union Jack-y. Then there was the Mamas & Papas mail-out that made me lose the plot: “pretty in pink” and “cool dudes in blue”. Speaking of losing the plot: a whole heap of parents did a few years ago in Sweden, when it turned out that boys’ clothes in a high street clothing shop were larger than girls’ clothes of the same size – and that’s despite using size units based on centimetres, which the last time I checked were pretty fixed and gender-less. The explanation? Well, boys need more loosely-fitted clothes to be free to move about and mess around. So size 80, logically, became size 82-ish, give or take an inch. Don’t get me started. Three things. Firstly, I’m not trying to tell you how to dress your kid, nor am I hoping to impose restrictions on anyone – quite the opposite. Secondly, I’m not suggesting that you’re forcing toys into the hands of your kids against their will, though I’m tempted to assume that you’re paying for a good few of them. Finally, it’s rare that babies are pulled out of the womb with forceps, going “Hiya, so you’re the parents? FYI, I only wear pink, OK? Blues and dark colours just don’t go with my complexion.” Still, somehow, so many girls eventually end up like that. Few boys do. So it must be genetics, right? Yesterday, within the space of just a couple of hours, I came across two different examples of people who clearly believe the opposite. First, it was the Toys R Us announcement that they are dropping their previously gender-specific marketing of toys, admitting that the use of sexist stereotypes in the labelling and arranging of toys in the shop could have a negative influence on children. I then read about Girls Will Be, a clothing line born out of the hatred of form-fitting clothes, producing comfortable garments decorated with gender-neutral symbols and phrases. You could of course question the decision to design such clothes for girls specifically, as opposed to children generally, but let’s for once just revel in the realisation that there are people out there who see what’s going on and are brave and driven enough to actually do something – people who might just be stubborn enough to change the world. The thing is this: boys will be boys, regardless what clothes they wear or what toys they play with; they’ll be boys because of their genetic make up. But that’s not what the expression means. The expression refers to boys and men who behave irresponsibly, aggressively, naughtily. What’s so desirable about that? Cue the same countless parents as above, shouting “political correctness gone mad!” Funny that, as it tends to be these aggressively defensive and conservative people who accuse feminism of being aggressively militant, despite the fact that it, at its very core, is the complete opposite, promoting inclusion, open-mindedness and freedom. If this is political correctness gone mad, let’s all go absolutely bonkers and see what happens if we remove all the box-ticking, platitudes and preconceptions and let kids figure things out for themselves. If your son is such a stubbornly tough little terrorist by nature, surely you’ve got nothing to fear? Image, by Flickr user ntr23 shows two badges on a computer keyboard. 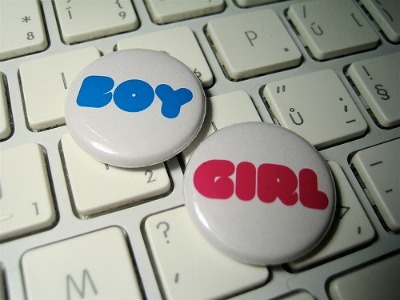 The word “girl” is written on one badge in pink and the word “boy” is written on the other in blue. Used under a Creative Commons License. It’s all such hogwash. All this pink; after all, pink was a boys’ colour not 100 years ago. I once chatted with a woman who was insistent that her son (aged about 4!) should rush around like a “little terrorist” as (I forget the exact words) that’s what boys should do. Indeed, I think she’d have been down at the shrink’s if he hadn’t been. Now, I’m not suggesting that children do not have personalities. My nephew emerged from the womb raring to go whereas his brother was so laid back he was horizontal. However, HOW those personalities are expressed is the issue here. I get irritated when parents (and my own flesh and blood are no exceptions) say their child has exhibited a particular behaviour, “So, it must be genetic.” My nephew, after playing with a friend, came home with a new trick: he’d knock something over and say “Oh No!” and did it over and over again. Genetic? Clearly not, as this was his friend’s quirk. He’d never done it before and clearly picked it up from his little friend. The idea that your little cherub is NOT influenced by the outside world is plain naivety.